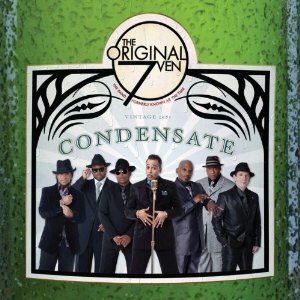 CD Review: The Original 7ven, "Condensate"
Ah ha haaah! The Time are back whether Prince likes it or not. It’s time to Condensate. A group purporting to be The Original 7ven have just arrived on the scene with an album called Condensate. I say ‘purporting’ because they are, in fact, the legendary Minneapolis funk band The Time, always have been, always will be…if you saw them live. If you were solely a fan of the albums from The Time, what you were getting was a duo, sometimes a trio, consisting of vocalist Morris Day, occasionally guitarist Jesse Johnson, and mostly producer Jamie Starr otherwise known as Prince. The Time was the payment Prince offered Day for a groove Day developed, ultimately becoming the track “Partyup,” but that payment came at a cost. The group was, for the most part, a secondary Prince project benefiting from his overflow of material. Considering this was one of his most creative eras, even the slush was pretty darn good. The live band that toured as The Time included some fairly heavyweight talent, not the least of which was the massive production duo of Jimmy Jam and Terry Lewis. So here lies the major schism in what The Time is perceived to be: live, they are this vital group longing to be a creative force. On record, they funk like nobody’s business, but simply aren’t the band you saw on stage. They’re Prince, Day, and sometimes Johnson. came out that Jam, Lewis and the rest of the stage Time got their due, but the sound was not quite the same. Jam & Lewis were the progenitors of the New Jack Swing sound of the early ‘90s, the force behind some of Janet Jackson’s biggest smashes, and were not Prince even though they learned much from the Purple One. People who bought that album were hearing, for the first time, the real Time, but might have rejected it because it wasn’t how the early albums “felt.” That was, unbeknownst to many, like a Prince record. Pandemonium still sold well, had a solid hit with “Jerk Out” and, as reunions go, was successful but Jam & Lewis didn’t really need The Time anymore. Their “soul mate” benefactor was going through identity crises of his own. It was, to an extent, a one-and-done affair. But now, The Time is back with a whole bottle of chili sauce. Depending on what you consider to be the definitive Time, Condensate is either a good thing or a bad thing. On the plus side, this is a fun album; a lot funky, a lot nasty, and while it doesn’t have a Parental Advisory sticker on the front, I wouldn’t suggest it as bedtime fare for the kiddies (particularly the prolonged and overt sexuality of a track like “Sick,” which also happens to rock a l’il bit). As ever, Morris Day fronts as the unrepentant loverman who doesn’t sweat. He condensates, as only the cool do. The overriding sound of the disc is very modern, and that comes through on the first single “#Trendin’” which name checks tweeting with uncomfortable frequency, but this never was a band that worried about such matters. As such, what would have induced groans from me (I’m looking toward Greyson Chance’s “Unfriend You” contemptuously at this moment). The Time has never asked to be taken capital-S “seriously” in terms of content; only to cut loose and have fun. However, they’ve wanted for the better part of the group’s existence to be taken capital-S “seriously” as a band. Condensate is fun. I even like the little dig they got in on the cover, as Prince would not allow the band to continue on as The Time, prompting the rechristening as The Original 7ven. Underneath that reads “The Band Formerly Known as the Time,” a bit of a jab at Prince’s unpronounceable symbol days. And his presence is still felt in spirit as “Strawberry Lake” and “Toast to the Party Girl” all have that slightly familiar and welcoming classic feel about them (meaning they certainly do more than nod to Prince’s sense of the funk). But the dominant sound of the disc is Jam & Lewis which is not a bad thing, but certainly a different thing. The listener will need to choose for themselves “What Time Is It” but for those willing to accept that these Original 7ven are the flesh-and-blood manifestation of The Time, as opposed to the secondary suit Prince occasionally slipped into, you will have a sleazy good time.